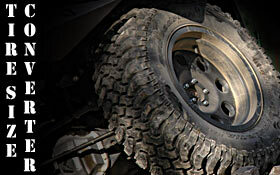 As wheel sizes go up, more and more off-road tires are coming in Metric sizes. How do you figure out how big a tire is in good old fashioned standard US measurements? Now it's easy! Just plug in the size in the form below to convert it.